Your association needs flexible payment options for events, auctions, conferences, and more. Thankfully, AffiniPay for Association has got you covered. 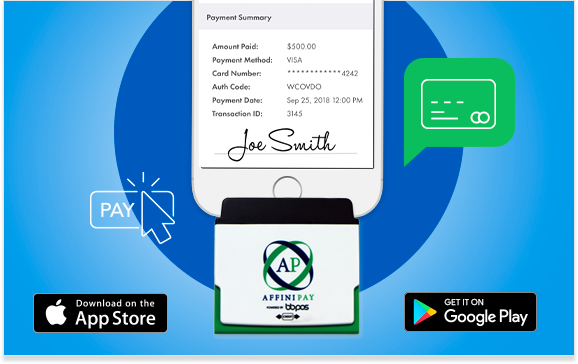 Our secure mobile technology lets you send bills, monitor transactions, and accept payments with the AffiniPay mobile swiper and app. Get everything you need to manager your association’s payments in your pocket and at your fingertips. Never feel like you’re tied to your computer or office. Run your association wherever you are. With the AffiniPay mobile app, you always have the tools you need to efficiently run your association. We know that your association needs to be able to take payments through your website, at live events, and everywhere in between. With the AffiniPay app and mobile swiper, you have a secure way to take and manage payments anytime, anywhere. Run a charge, manage past transactions, and view your association’s account information whether you’re in your office or on the go. To accept payments, enter the dollar amount and card number or use your AffiniPay swiper to quickly capture card information. View your transaction history through the AffiniPay mobile app. You also have the ability to void, refund, and send email receipts to your members.